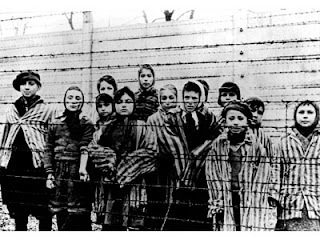 Background: "The Farish Family's Auschwitz Profits and Connections"
After hearing rumblings at work and on the sale grounds about Jim Squires' new book, "Headless Horsemen," I decided to read it and find out what all the fuss was about. It's one man's view of the Thoroughbred industry, and it's not pretty. But I also can't say that a lot of it isn't true. In regard to underhanded dealings at sales, Squires writes of controversial situations I have heard about -- some of them in different versions and nearly all of them difficult to verify to the point where you can name names in a magazine, newspaper, or online story. He also relates his own experiences with his own sale horses, but stops short of saying exactly which farms or bloodstock agents were involved. Squires does two things very well. His emotional involvement with his own horses helps the reader understand why people are attracted to the sport even though it is full of maddening and absurd elements. And even though it's clear there are some people and situations Squires doesn't like, he also doesn't paint every issue as black and white. He rails against Will Farish and the rest of the Thoroughbred elite he calls the "Dinnies," but he also describes a visit to Belmont Park and a cordial conversation with a gracious Farish and writes about doing business with the Lane's End Farm owner. My only real complaint about "Headless Horsemen" is that the fact-checking and editing could have been better. The Green Monkey isn't a "red" horse; he's a bay. His name is not the Green Monkey; it's The Green Monkey. Sheikh Mohammed didn't leave the Keeneland September yearling immediately after 9/11 as the book implies. He was stuck in Lexington for a while because no planes were allowed to fly, and he came back to the auction and bought more yearlings. Those just are examples. Other mistakes can be found easily by people who have a little knowledge about Thoroughbreds and the people who own them. 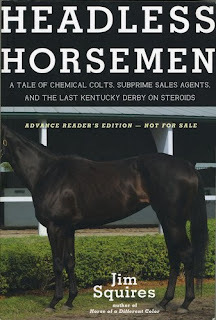 But, those problems aside, I think it would be a good idea for people getting into the Thoroughbred business to read "Headless Horsemen." I have talked to a number of newcomers who have been bewildered and surprised by what they found while, at the same time, remaining enchanted with the sport. The book explains the good and the bad - and all the contradictions - about breeding and racing better than I, or most other people, ever could.